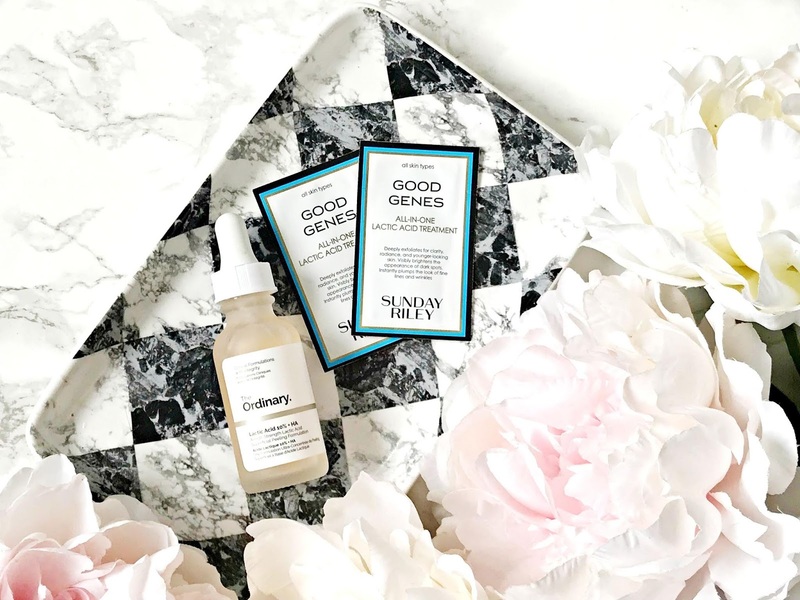 The Ordinary Lactic Acid 10% + HA - a dupe for Sunday Riley Good Genes? I've raved about Sunday Riley Good Genes a few times previously on the blog (here and here, for example!) because I find it so effective on my skin. I can feel it eating away the dead skin cells and my skin is always left feeling smooth with refined pores and looking radiant when I use it. When I finished my recent bottle of Good Genes, I found that I couldn't repurchase it as it has been taken off the market to be reformulated to comply with EU regulations. I have to admit that I was gutted and I only have a few sample sachets left. I looked into what I might be able to use as an alternative and decided to give The Ordinary Lactic Acid 10% + HA a go. Is it a dupe? Read on! Good Genes contains 5% lactic acid, which is an AHA. Lactic Acid is gentler than glycolic acid yet it is still very effective in exfoliating and renewing the skin. My personal preference is to use it at night and I always wake to glowing skin. As the name suggests, The Ordinary Lactic Acid 10% + HA contains 10% lactic acid and with that in mind, I expected and hoped that the results might be even better than those with Good Genes and I would be making a saving of almost £80. The texture of the two products is different, with Good Genes being a milky texture and The Ordinary product being a gloopy liquid. Good Genes has a pump and The Ordinary has a dropper. When I initially used Good Genes, I experienced mild tingling but no redness so I expected the same from The Ordinary product but I didn't feel any tingling at all and also didn't experience any redness. I applied it exactly as I did Good Genes - as a serum, which can be followed with other products or used alone. I have used The Ordinary product as part of my night-time routine several times weekly since buying it and I have to say that I have been extremely disappointed. It literally does nothing for my skin and is the worst AHA product that I have used. My skin is well used to acids and retinols so perhaps if you are new to AHAs, you might see a difference but I haven't found it effective in exfoliating, smoothing, renewing or brightening my skin. I may as well not be using anything on my skin - that's how ineffective I have found it to be! In short, is it a dupe for Good Genes? Definitely not! I am really hoping that the newly reformulated Good Genes is every bit as effective as the original. I will let you know when it is released and I have tried it. I would love to know if you have used any product that you would consider a dupe for Good Genes?